World Diabetes Day 2015 - The Year Of Healthy Eating Healthy Living Events! | Life, Sport and Diabetes - An everyday look at my life with type 1 diabetes. World Diabetes Day 2015 - The Year Of Healthy Eating Healthy Living Events! Wow, well if you follow my Instagram or Twitter, you'll know that it's been a fabulously busy time so far for Diabetes Awareness month this November! I plan to blog and vlog about each of the things I've been up to individually, but to celebrate the day itself here's a visual round up of what I've been up to so far! Preparation for World Diabetes Day (WDD) actually started off at the end of October for me, when I was asked to speak to MEPs at the European Parliament in Strasbourg on the importance of nutrition and exercise in helping people with both types of diabetes manage their condition by IDF Europe. The event was organised by the International Diabetes Federation Europe (IDF EU), who are also the designers of the blue diabetes circle that people so often see along with the concept of WDD. It was a brilliant event because there was so much engagement from those in attendance on the topic, that it felt like we were really making a difference. I was then asked by Diabetes UK Cymru to participate in the 'Taking Control' campaign, which was all about getting people with diabetes onto structured education courses. Going onto a DAFNE course thanks to the delivery by my diabetes specialist dietitian, completely revolutionised the way I managed my diabetes, and I want the same for other people. 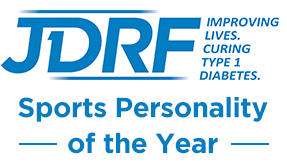 I then did an interview with JDRF UK (Juvenile Diabetes Research Foundation) about the importance of volunteering and public speaking. It was thanks to my paediatric diabetes consultant and his amazing team of diabetes nurses that I had my first public speaking experience, to 200 medical students not long after I was diagnosed. I'm grateful to him for a lot of things and getting me started on that path was one of them, so I feel that it's important to encourage others to overcome their fears and do good by raising awareness at the same time. This week I also attended the Diabetes UK Cymru Wales Advisory Council meeting, where we were joined by the newly appointed Chief Executive of Diabetes UK Chris Askew. Which was great because it gave me the chance to ask Chris questions about his future thoughts and plans for young people and those with Type 1. So look out for his answers in my upcoming blogs! Yesterday I was with a great Welsh company called Frio, who for those who haven't come across them yet make very innovative cooling solutions for people with diabetes to store their insulin. I've been using their products since I was diagnosed to help me manage my diabetes whilst going away on adventures. So it was wonderful to meet them in person for their WDD campaign on starting the day with a healthy breakfast. Although today is the big day in diabetes, we live with the condition 365 days a year. So the campaigning won't stop here, or for the rest of this month in fact. As my future plans for the rest of November include being with the BBC on Tuesday to speak on the radio, being with Protect iT on Wednesday looking at diabetic foot care, spending Thursday with Medtronic at their HQ and spending Friday with Kaleido a new pump company. So watch this space! But if you're looking for way to get involved in WDD today, please wear blue, ask friends and family to do the same and use tools like social media to raise awareness of the condition. Me Wearing Blue For WDD!